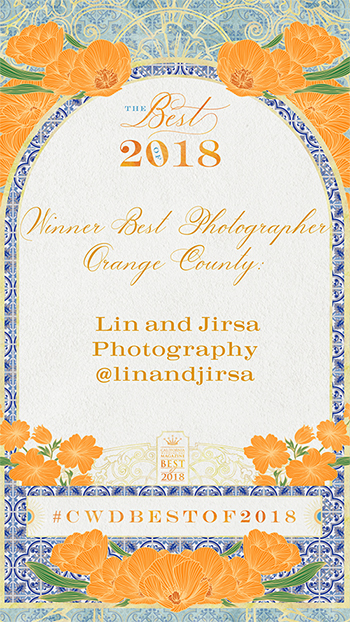 What an honor to be named California Wedding Day‘s Best OC Photographer for 2018! We take pride in our work and are truly thankful for this recognition. Thank you to all who voted and continue to support us! California Wedding Day’s Best of 2018, honors the most innovative and creative talent in the wedding industry from Los Angeles, Orange County and Central Coast! The finalists were chosen by their peers through an open voting process held online at californiaweddingday.com. Winners were announced at the vibrant So-Cal wedding industry’s event of the year at Vibiana on May 15 and will be published in the Summer 2018 issue of California Wedding Day.